For nearly 60 years, Crystal Mountain has been a place where families and friends gather to experience the best of Northern Michigan and create precious memories. To preserve its unique character, Crystal Mountain’s design is guided by a disciplined master plan titled Emergent Directions. Emergent Directions is Crystal Mountain’s blueprint for thoughtful, steady development to preserve and enhance the kind of Northern Michigan place for which people yearn. It defines a 21st Century, carefully planned pedestrian-oriented community that is deeply rooted in its Northern Michigan heritage. Over the past 15 years, many elements of Emergent Directions have come to fruition. In 2002 the three-story, 28,000-square-foot Kinlochen opened, housing Crystal’s golf pro shop and the Nordic Center, a year-round restaurant, and 12 unique one-, two- and three-bedroom condominiums on the upper two levels. Another addition, the North Face slopes, opened that same year adding 11 downhill runs and a quad chairlift on the north side of the mountain. Between 2004 and 2006, the Park and Cottages at Water’s Edge, a $13 million investment, was completed. This project includes a one-acre outdoor waterpark and playground, a 32-foot climbing wall, an outdoor hot tub, and the 5,000-square-foot building with locker rooms, the Park at Water’s Edge activity and retail area, and staff offices. Also part of the project is the Cottages at Water’s Edge development, which is comprised of 22 two- and three-bedroom dwellings that recall Northern Michigan cottages from the early 1900s. Crystal Mountain solidified its commitment to healthy lifestyles and environmental stewardship with the Crystal Spa and remodeled Peak Pool & Fitness Center that opened in January 2009. This nationally acclaimed 18,500-square-foot facility is at the core of the resort and is a mecca for relaxation, renewal and rejuvenation. In keeping with Crystal’s dedication to sustainable practices, it is the only spa in the Midwest to be Leadership in Energy and Environmental Design (LEED) certified. Despite the downturn in the economy, Crystal Mountain kept its focus forward and between 2008 and 2012, added the Bungalows at Crystal Glen. This slopeside community features eight three- and four-bedroom units built in the historic architectural style characteristic of Michigan’s Arts and Crafts bungalows from the early 1900s. Trailside, Crystal’s newest whole-ownership neighborhood, is a collection of clustered homesites linked by hiking and cross-country ski trails, and nestled into the woods between four holes on the resort’s signature Mountain Ridge golf course. A number of Trailside cabins have been constructed in Trailside’s five phases. On the mountain, two new lifts were added between 2011 and 2013. First, the $1.3 million Loki Quad chairlift and loading conveyor was completed in fall of 2011, serving the newly reconfigured Loki/Thor ski complex, and in 2013, a new quad chairlift was installed on Buck, bringing with it three new runs, plus snowmaking and grooming additions which together, represented an additional $4 million in improvements to the slopes. In 2015, Crystal Mountain embarked on the next chapter of its Emergent Directions journey – an $11 million expansion which included a new slope complex composed of eight ski slopes and a chairlift. The Backyard, as the slopes are known, opened in January 2016 and are located on the backside of the mountain in between the Ridge and North Face slope complexes. The slopes were designed by the SE Group of Vermont, which also designed the Ridge and North Face slopes. Also part of this $11 million project is the four-story, 31,200-square-foot expansion to the Inn at the Mountain, which was completed in December 2017. The addition includes the Bru Bar coffee and wine bar, and the Mountain Market specialty grocery, both on the main level if the expansion. On levels two and three are the eloquent Inn Residences, a collection of eight two- and three-bedroom condominiums that are contemporary in design, yet with several Northern Michigan touches. A rooftop terrace on the fourth level serves as an open-air, outdoor parlor and event venue, offering stunning views of the slopes and surrounding village. The plaza between the Inn and the Lodge is undergoing a major transformation as well. Once completed Barr Park, as it will be known, will feature waterscaping, ornamental grasses, sweeps of massed perennials, and flowering shrubs and trees. Located at the heart of the resort, Barr Park will offer a variety of gathering and relaxation areas of all sizes. 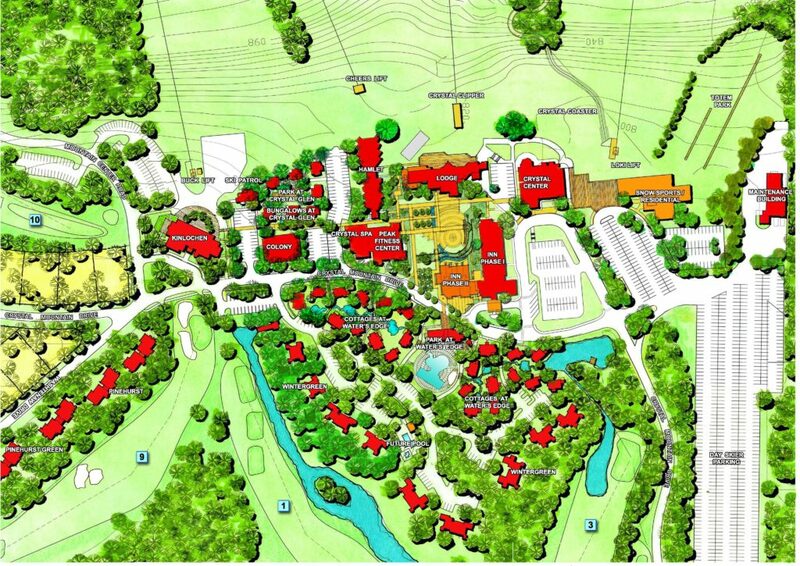 This most recent expansion investment represents the single largest in Crystal Mountain’s history and latest in what is approaching $100 million of growth and development over the last quarter-century. Still part of Emergent Directions are additional on-mountain, golf course -oriented residential developments, plus on-going snowmaking and recreational improvements. The vision for Crystal’s future as documented in Emergent Directions is an evolving road map that guides all land use decisions. It is not a static plan, but rather dynamic, and can adapt to changes in market conditions. With an iterative approach to development, Crystal Mountain continues to carefully plan its future development to meet market preferences and to create sustainable value over time. "Overall very good service. The team at Crystal Mountain Realty made the process of selling our condo smooth and easy. Very professional organization."